Antisense RNA is complementary to other RNA or DNA sequences. In bacterial cells, it may inhibit translation by binding to sequences in the 5' UTR of mRNA and preventing the attachment of the ribosome. 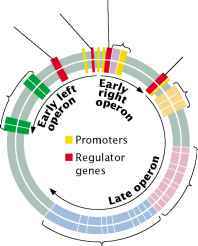 4 16.18 The bacteriophage X chromosome contains four major operons: the early left operon, the early right operon, the late operon, and the repressor operon. stimulating transcription. The X repressor, which plays a major role in X gene regulation, can act as either an activator or a repressor. this controlled transcription ensures that genes appropriate to each stage of the lytic or lysogenic cycle are expressed. A third feature of X gene regulation is the use of transcriptional antiterminator proteins, which bind to RNA polymerase and alter its structure, allowing it to ignore certain terminators (<Figure 16.19a). In the absence of the antiterminator protein, RNA polymerase stops at a terminator located early in the operon (<Figure 16.19b), and so only some of the genes in the operon are transcribed and translated.